Diamond began its roll-out of December 2008 sales figures today with the release of market shares and the Top 10s for several categories. 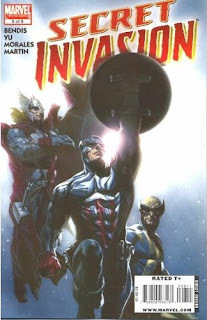 "The conclusion to Brian Michael Bendis and Leinil Yu’s epic limited series event, Secret Invasion #8 joins other series issues at the top of the sales charts, marking an unprecedented run for the title," Diamond reports. The Comics Chronicles can confirm the unprecedented nature; every issue of Civil War topped the charts in their release months in 2006 and 2007 — but there were seven issues of that, as opposed to eight of Secret Invasion. Only the November break kept there from being eight consecutive months for the title on top. The longest Diamond-era run for a series on top of the chart was for Uncanny X-Men #366-375 in the ten months from January 1999 to October 1999. I am checking into the market shares to see if the quantity and dollar columns in the charts provided were accidentally transposed (as it has Marvel's dollar share higher than its unit share and the reverse for "Other," something which would be highly unusual). I'll update as I get confirmation. In any event, the ranking for both categories was Marvel/DC/Dark Horse/Image/IDW. Diamond reports the full listings will be out on Monday.